Once you have all three shards, right-click one of them to receive "Hermit's Hideway", a one-room house. Note: Unlike other houses, this one is placeable with a free-to-play account. More screenshots are found on the Hermit's Hideaway page. Found a Hermit's Hideaway House to complete the exploration. It is located under Lunacy Unbound Guild, 101 Market Heights, its open to anyone. Hope this helps. On Prexus (The Rathe), an open Hermit's Hideaway can be found at Clan nan Dreolan Village, 106 Brimming Heights. The owner is Jarrah, if you'd like to search on his name. I ran from neighborhood to neighborhood right-clicking on houses till I found one that identified as Hermit's Hideaway. Traveler Achievements don't seem to be listed. This home, as a zone, is associated with achievements "Hermit's Hideaway Traveler" which is a sub-set of the achievement "Housing Explorer." With that said, anyone know of a Hideaway on Bertoxx? Couple years later, I know, but I just found a Hermit's Hideaway on Bertox. 103 Market Heights, Pine Colonial Island. Owner's name is Nutari. We are a user-supplied site. As ever, if you have information for these quests or any other game info, please post them on the site or mail them to eqteam@allakhazam.com with full logs, screenshots, and any other relevant snippets. As I cannot be the only one searching for places to visit to complete the traveler's achievements, and have just come to own a hideaway myself, I thought I should share it's location. Please forgive the sparse decoration for now, I've had time to collect many things but no time to sort them for display! But please, stop by 107 Terminus Street (the lakefront house) in Feral Fury Village. If you're on Bristlebane and need to check out a Hermit's Hideaway feel free to drop by FU World Order Village @ 103 Vanward Street. It's searchable by my char name as well. Good luck with the rest of the explorer achievements. Come by anytime and poke around.Everyone should have access to activate the items with options to do so. Let me know what you think. I knew people might use it to finish the traveler achievement so I attempted to make it worth the trip. - When placed on a housing plot the hideaway reduces the upkeep cost by 42 plat making it no cost per day. You do however need to put some currency in escrow but, it never depletes and the time left will note "unlimited." Also I'd like to thank the player's who design items via the player studio. You guys keep making better and better placeables. Keep it coming! **I've since heard it was available for a short time by accident in the station marketplace but, I've yet to see it listed since originally reported, as such. For the time being it's still granted by obtaining the aforementioned LoN loot cards and clicking one of the gems bundled with the items. You must have all three in your inventory whilst clicking one to claim. Whomever was there has either moved or changed their house to a regular three-bedroom house. 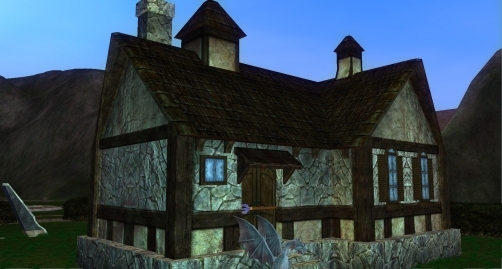 As of 3/25/2014, Hermit's Hideaway was available on SC Marketplace for 500 SC. Thanks helped me a ton...now if I could just find a Grand GH and some Wedding Chapels! Does anyone have one of these on Erollisi Marr? I need to enter one for the explorer task and I cannot find one. I am on The Rathe - Prexus server, and I can not find anyone that has one of these either, let alone has it open for visitors. It's the last traveler location I need to finish the explorer achievement, does anyone know of a plot that has one on my server? I got this from LoN loot in a packaged called "Wrapped Painting", which included the Fir For Kings painting and the shard, and a container. I am not sure which one is which shard but I would assume 3 is Sapphire. got sapphire shard with Ice Dragon Avatar painting.